It’s time to break out the cowbells and get your spots on because Chick-fil-A is issuing a cattle call. And, it’s a hot deal worth mooing about. The 10 Chick-fil-A restaurants in San Diego County are expecting to give away about 10,000 Chick-fil-A entrées (tons of udderly delicious free food) on Tuesday, July 11, as part of the nationwide chain’s customer appreciation promotion called “Cow Appreciation Day.” Any customer who visits a Chick-fil-A restaurant dressed as a cow on July 11 will receive a free entrée. Adult customers who dress in any type of cow attire, whether it’s “head-to-hoof” or sporting a simple cow-spotted accessory, such as cow-pattern hat, scarf, tie or purse, will be rewarded with a free entrée of their choice, such as an Original Chicken Sandwich, seasonal Smokehouse BBQ Bacon Sandwich or breakfast favorite, the Egg White Grill. Sporting any type of bovine garb with spots, such as a cow-print shirt, novelty horns or a cowbell, will score the free food. Children can receive a free Kid’s Meal for dressing in a cow costume. Salads will not be redeemable during Cow Appreciation Day this year. Fans also can share pictures of their costumes on social media by using the hashtag #CowAppreciationDay. Additionally, all free-standing Chick-fil-A restaurants will have an active Cow Appreciation Day Snapchat filter that will allow guests to share their experience with friends and family. Chick-fil-A restaurants in San Diego County are located in Chula Vista, Encinitas, Oceanside, San Marcos, Santee, Escondido and in San Diego on Sports Arena Blvd., Camino Ruiz in Mira Mesa, Carmel Mountain Road in Carmel Mountain Ranch and Camino del Sur in 4S Ranch. For addresses and directions, visit www.chick-fil-a.com. 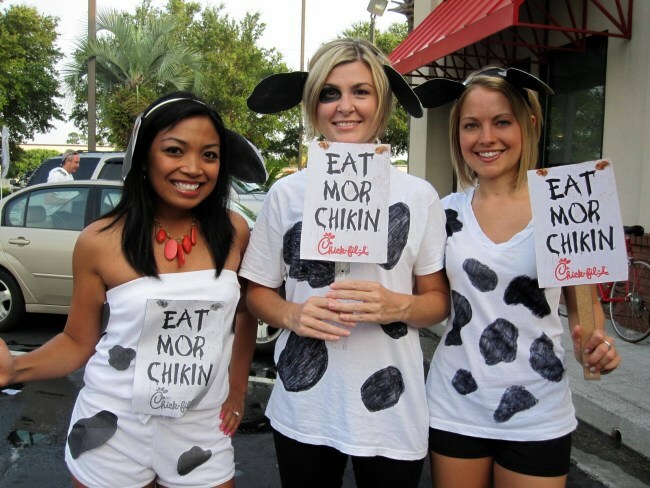 Chick-fil-A began celebrating Cow Appreciation Day in 2005 and participation has grown each year, as Chick-fil-A has expanded across the country. In 2016, nearly 1.6 million free entrees were given to cow-dressed customers.